While Brad Bird's "Ratatouille" was certainly a tough act to follow, Pixar has outdone themselves yet again with this latest feature from Andrew Stanton, director of 2003's "Finding Nemo." "WALL-E" is a visual wonderment, a fantastic sci-fi adventure, a cautionary tale, a smart satire, and most importantly, an endearing love story. We've always come to expect Pixar to surprise us with something new, but "WALL-E" breaks whole new ground. It pushes the envelope on what a simple G-rated animated movie can do by providing much more than just entertainment for kids. This is a movie for all ages, a movie that beautifully resonates with universal meaning and poignant storytelling. It's another win for Pixar, the studio's best yet, and a masterpiece. The first half hour or so of the movie contains no dialogue whatsoever, and it left me equally speechless. We're shown a hazy post-apocalyptic landscape that is filled with crumbling skyscrapers and equally tall towers made of trash. The sun seeps through a filter of dust and grime in the air. It's a cinematically poetic moment that has dark implications. Through the rubble we meet WALL-E, which stands for Waste Allocation Load Lifter Earth-Class, a tiny, square robot that zips through the mounds of trash. He condenses it into squares constructing his own skyscrapers of cubic junk and also busies himself all day digging through the piles finding new artifacts to collect including things like a Rubik's cube. At the end of his day, he takes the tread off his wheels, settles himself in his little shack full of stringed lights and all the other stuff he's collected, and goes into sleep mode only to begin again. WALL-E has been alone on Earth for a long time. Seven hundred years to be exact. We discover that the humans trashed Earth to the point where they had to abandon it for a spacecraft called Axiom that resembles a luxury cruise line. A massive corporation named BnL, short for Buy N Large, took over and basically filled Earth with too many superstores for it to handle. And so, the accommodating company just took it and its customers into space instead. It's a hilarious take on the future of the Wal-Mart nation, a much heavier theme than Pixar is used to tackling and one that probably made the corporate overlords at Disney pause a moment. Andrew Stanton pulls off an unbelievable balancing act by skillfully not letting any of these undertones ever become too much of a lecture. This is only a very small portion of the massive journey ahead for our little robot hero. Aside from doing what he was programmed to do, WALL-E has acquired a personality and also spends his time watching a worn videotape of the 1969 musical, "Hello, Dolly! ", which WALL-E uses as a basis for his emotions. (It's also a beautiful addition to the movie's soundtrack which fittingly includes from "2001: A Space Odyssey," "Also Sprach Zarathustra.") He longs for love and befriending a quirky little roach just isn't quite enough. Lucky for WALL-E, though, he's about to have a visitor. It comes in the form of EVE, which stands for Extraterrestrial Vegetation Evaluator, a floating white, sleek, egg-shaped robot. She arrives on a spacecraft sent from Axiom to search for any signs of life. She's intimidating to WALL-E because when any one thing surprises her, she has a little tendency to blow things up. But even so, WALL-E falls for her and follows her around everywhere. They finally meet, and, rather than talking, they simply introduce themselves and burble each other's names. And then WALL-E surprises her with something he found while rummaging through trash: a tiny green living plant. And it's this minuscule trace of existence that sends EVE back to Axiom with WALL-E following right behind. 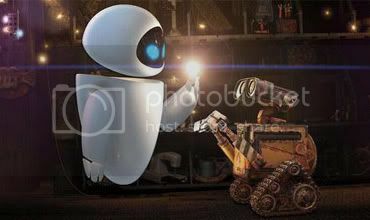 This pairing of EVE and WALL-E is absolutely adorable and is truly the heart of the movie throughout. It's amazing how much emotion can be conveyed through these completely inhuman beings making them feel so...human. These robots are given a soul, and we feel an immediate connection to them. Through the simple slanting and focusing of WALL-E's binocular-shaped eyes or the widening and narrowing of EVE's solid blue projected eyes, they are able to express themselves without words. The design of these two characters is enough to win over anybody's affection. Aboard the Axiom, we meet who's left of the human race. They are hugely lazy, overweight, and pudgy-faced citizens who are literally immobile and are transported around on hovering lounge chairs with their meal through a straw and a screen in front their face. But these overgrown babies aren't represented as bad people, either; they're us, only exaggerated. They are lead by the large captain (voiced by Jeff Garlin) who has never even seen Earth before and becomes intrigued by the thought of it. The situation is given a face through archival footage of a CEO (played by Fred Willard) who uses the phrase "stay the course" in witty satire. The singular plant brought by EVE and WALL-E, though, provides hope, and that's where the rest of the story takes off. I'll leave it at that because I've already given too much away. There are plenty of fun sequences on the ship as EVE and WALL-E join together with dysfunctional robots from the repair ward to try to save the plant and themselves. And it is absolutely stunning to behold as Stanton weaves together two entirely inventive worlds. It's the most visually impressive movie of Pixar's to date with an effective contrast between the barren remains of Earth and the bright, metallic interior of the spacecraft. There's a wonderful look to everything, very similar to that of "Finding Nemo" and many other Pixar features. "WALL-E" provides a fascinating contradiction. It carries a deep message about how the creation of new things can either destroy or save us, and the latter provides a hope for humanity. The magic of this movie is that, while delivering this message, it never steers astray of its main goal to charm, amuse, entertain, and dazzle. This is the darkest Pixar creation yet and even with so much going on in the movie, which alone makes it deserving of more than one viewing, it's the love story that prevails in the end. This is what makes "WALL-E" such a breathtaking, sentimental, and astonishing movie. I already want to see it all over again. This is not only hands-down the best animated feature of the year but also the very best film of the year so far. I am happy to see someone love this as much as me. Its truly an amazing film and after 4-5 viewings, it has become one of my favourites. Definitely Pixars best. Stop by my blog if you ever get the chance.